Product #26389 | SKU 71009 | 0.0 (no ratings yet) Thanks for your rating! SkyMasters are economically-priced large aperture offerings from Celestron. They're great for both astronomy or long-range terrestrial observing. High-powered binoculars are difficult to hold steady by hand; a monopod( and a tripod adapter if not included with the binocular) with an incorporated fluid pan/tilt head or with such a head attached between the monopod and the binocular is highly recommended. Celestron binoculars, excluding the digital VistaPix series, include their wonderful "No Fault" warranty coverage, which assures that your binoculars will be repaired or replaced at Celestron's option for as long as you own them-no questions asked! 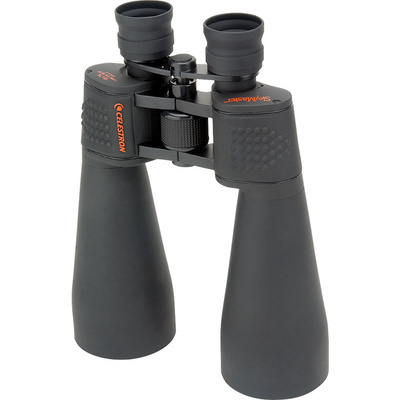 The only requirements on the user's end are to ship the binoculars( at the user's cost) to Celestron with a proof of purchase and a cheque or money order for $25 to cover the costs of inspection, shipping and handling. This warranty service is valid only for USA and Canadian citizens purchasing from an authorised Celestron dealer.